At the moment, we have three blooms of hydrangeas in the garden! They are quite substantial in size and gorgeous. This is only the second or third time he has managed to coax these blossomsâ€¦ so it deserves a post, I think. Even if they donâ€™t bloom, the plants have really vibrant foliage so they make a nice ornamental plant hedge. 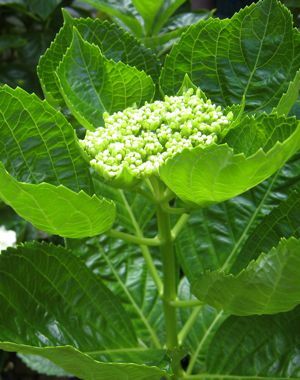 And in case you are wondering what those leaves are that Ina Garten (Barefoot Contessa) always uses to freshen up her buffet platters of desserts, fruits and other foods, they are actually hydrangea leavesâ€¦they are lush and green and last a long time without wilting. Oh, and in the corner of that last photo, notice the Kidâ€™s dog wondering what all the fuss is aboutâ€¦ maybe it was her “fertilizer” that made this all happen! Congratulations! I’ve always wanted to have this but doesn’t have enough courage to nurture one. You inspire me! Wow, lowland blooms. I only ever see this in bloom in Tagaytay or Baguio. Pogi points for gardener. Nearly didn’t notice her in the picture, she sort of camouflages, like a tiger! A favorite road of mine in San Francisco has hedges and hedges of blooming hydrangeas. They are a gorgeous sight, so robust, and generous. For the past two All Souls’ Days, my mom has been purchasing milflores/hydrangea plants to bring to the cemetery instead of the usual cut flowers. Then afterwards she gives the plants to us. We’ve kept most of them in pots and planted some in our garden and although the leaves are healthy, we haven’t succeeded in making them bloom yet. Perhaps your gardener has some tips he can share, MM? Did he put fertilizer? Lovin’ the red-rubber nose! Happy for you, Kid! I also love hydrangeas/milflores. I was able to buy four plants in AANI market and I arranged them in our patio together with some orchids. Ang ganda tingnan. :-) I also a fan of ina garten. I love her house, her blooms, her plants, her food…Hhayy How i wish I could have a house like that and also have her talent in whipping great dishes for her family and friends. You have a very healthy looking hydrangea hedge. Mine has just shed the last bunch of flowers and getting all geared up for the cooler days of winter. I trimmed then short to force more foliage and hopefully earlier flower shoots. What do I know? I operate on pure passion, and if there is some science to it, then great. Hydrangeas thrive better near the pond, I observed, and like generous watering and good soil drainage. you also have the white variety that eludes my “sort of green” thumb (or fingers. If you get enough white blooms, they would look great on your Christmas table, eh? Been enjoying your posts and your admirable sense of goodwill and charity. Makes me guilty for not posting lately. Sorry. I will catch up soon. Darn, if I were nearer, I would have lined up for those shirts. Those cloth totes are all the rage in stores. They are offering similar totes to purchase as alternatives to the plastic bags (think carbon footprint, the phrase of the moment). Enjoy your holidays as I slave over a dozen Cornish hens. I am not doing turkey this year ;). 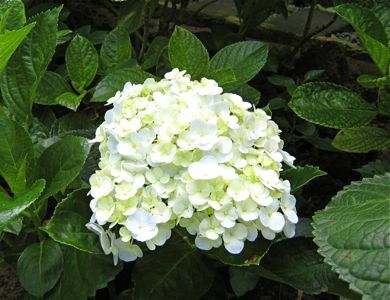 your gem of a gardener deserves the post –gem because he succeeded in making the hydrangeas bloom in polluted makati! Its funny my maiden’s name is Miraflores.. and I thought for a while..this flower is spelled this way. Anyway, Hydrangeas makes me home sick for North Carolina where I stayed for 2 1/2 years. We rented a house in the “boondocks” district of Jacksonville, surrounded by corn field, cows, horses, turkey farm, barns, creeks, and huge pine trees all over. At the house itself are 4 hydrangeas shrub, which blooms great but not as profusely as my neighbors (theirs are undescribable). I believe its the weather in NC. 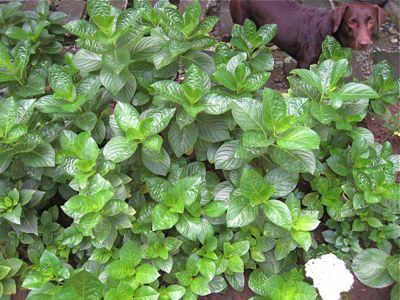 As for Philippine’s propagation, I did not know it can survive there, I would ask my hipag to look for a plant to buy and when I go there this summer.. its like going to NC again..
i love hydrangeas!! beautiful when it blooms in the spring into summer. It was the flower during my wedding 5 years ago. They’re pretty to look at, very simple yet elegant, they make wonderful centrepieces! My hydrangeas had a ton of early blooms, but they didn’t develop. They dried out and fell off. Only a few flowers grew around the edge of the bloom. What did I do wrong? I just bought milflores from Baclaran at 75 and 120 per pot, the vendor said that I put them in a shaded area and to water at least twice a day, I spray water on the leaves and flowers every now and then, I hope they survive cause I am planning to buy more, they really look beautiful in my garden. Love hydrangeas. Also saw Barefoot Contessa uses the leaves to decorate her platters. did that myself for a platter I brought along to a party and was informed that the leaves (and buds) of hydrangeas are poisonous. couldn’t believe this since the contessa used and suggested them. However I googled and TRUE they ARE POISONOUS. Ugh!